With 2000 lumens, the BUSTER 2000 is your power light for perfectly illuminated trails. The product comes with a powerful battery pack and an ultra-light remote with glow-in-the-dark buttons. 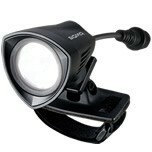 With a burn time of between 2.5 and 20 hours, the helmet light is your indispensable companion for any night ride.